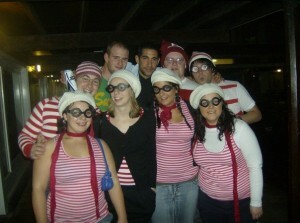 In the summer of 2006 a group of korfers started something new and set up their own club.. The club was set up by Founding members Andrew Barkwith, Mike Brayne, Mel Meshkat, Amy Dickens, Vicky Tunbridge, Chris “pillowpants” Sidebottom, Kevin Moss and Martin Quinn with help from Jess Rowden & Anne-Aline De Caestecker (Man Uni) in being the extra girls. 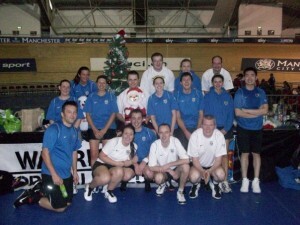 The club enjoyed success from the start with Warriors 1 coming 1st in the NWKL with an undefeated first season. Warriors were the first local league club to ever to reach the second round of the British Korfball Association Cup, though sadly we were defeated by the reigning Premiership Champions, Mitcham KC. 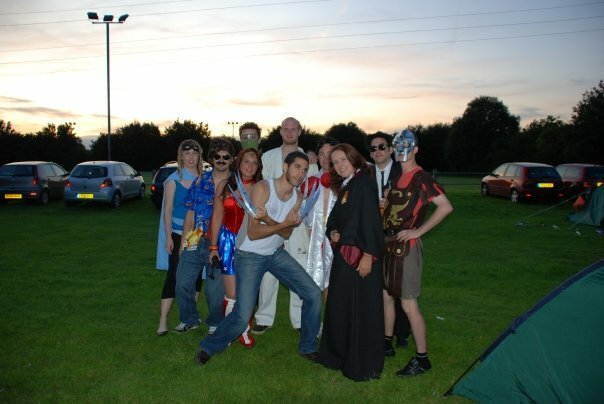 Warriors attended many tournaments in their first year including Edinburgh International Tournament, Norfolk, Nottingham, Birmingham and Leeds. The club also went to the Korfball famous Attila showing the international entrants how to play and party Warriors style! 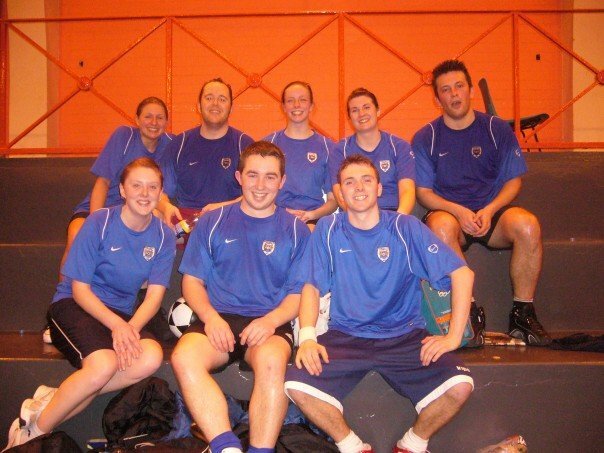 Some of the players were also ever present on the Student Korfball Team ensuring “Manchester Warriors” was publicised and marketed well to attract Graduates… Or it could have been to cling onto their youth. Warriors took our beginners to Lancaster’s Freshers Tournament and won, held our 1st Christmas Tournament which was a massive success and made the trip to the Edinburgh International Tournament. Warriors 1 came 1st in CEKL. Warriors expanded fast with Gav and Eleanor Legg, Kevin Jones, Pete Quinn, Ryan Keaney, Richard Dawson, Laura Blazey and Sam Barkwith. The team also recruited newbies Kim “Embra” Tirrell, Sam Scullion, Meg Turner, Howard Ainsworth, Les Ainsworth and Fiona Stinson. Warriors 1 came 2nd in CEKL1 followed by 3rd place in National League Champions Trophy pool B.
Warriors 2 were 1st in NWKL in their first season leading to immediate promotion to CEKL2. Recruitment facilitated the creation of a second team for Warriors. The season saw the arrival of Clemence Hindley from Horfield, Micki Barker from Leeds, as well as new to korfball Si Stubbs and Jenny McGuckian. Warriors 2 continued their strong run coming 1st in CERL2 for their second successive promotion. Warriors 3 also achieved 3rd in NWKL1. Further recruitment saw the arrival of Pete McGuckian, Tom Giddings, Laura Smith and Dave Dean allowing Warriors to grow to 3 teams for the first time. 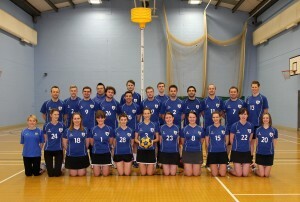 Warriors 1 had a solid season coming 3rd in CEKL1 followed by 4th at the National League Champions Trophy. Warriors 2 on the other hand faced a tough season with a new look team following the summer departures, coming 6th in CEKL1. 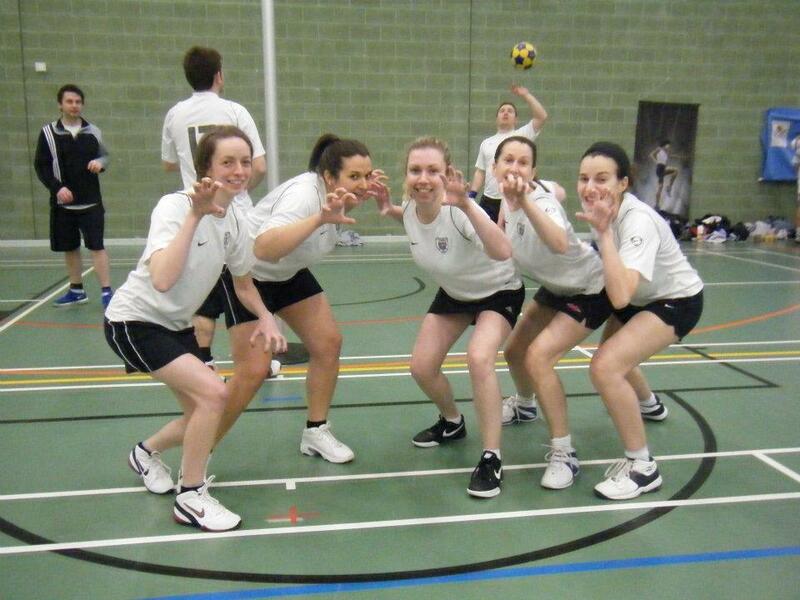 The club also took time out mid-season to attend the Edinburgh Korfball International Tournament. Our tournament form continued to be excellent, fantastic wins at the Edinburgh International Tournament and the Manchester City Summer Tournament (hosted by our local rivals…), among others. Warriors also returned to Eindhoven in April 2012 (after a four year break) to take part in the famous Attila tournament in Holland. A few members of the club were even called up for international duty. Kev Jones represented Wales in China (of all places) during the 2011 World Korfball Championships and Mike Brayne represented Scotland during the course of the year. Whilst losing a number of senior players from the squad recruitment saw the arrival of Chris Cooper & Sophie Laurenson from Bristol City, Pipp Saul-Harrah from Manchester University as well as new to korfball Katie O’Neill. Where’s Wally, Silver fancy dress, Scottish dancing in Edinburgh, shot fines from bowling, cocktail shaking (read drinking) and donning tuxedos for the Korf-ball were a few highlights of the season. Warriors 1 were winners of the first ever NW Cup. They also came 2nd in CEKL1 with Mike Brayne league top scorer which led to coming 5th in the National League Champions Trophy. Warriors 2 came 4th in the NWKL1 despite having to field teams of 7 for a number of matches. Pete McGuckian made a name for himself getting league Male MVP and also making the NW team of year. Once again the trip was made to Edinburgh, some mixed play on court led to full effort off court at the social! 13th out of 24 international teams, we were able to take solice that Los Luchadores, the eventual victors of the weekend, included a number of current (Mike and Mel) and past (Fro and Marv) Warriors. ¡Warriors para la victoria! Despite losing a large number of players before the season and having to drop the third team, a successful January recruitment drive helped Warriors acquire Andy Clements, Chelle Barker and Lucy Shattock, plus a new signing of Emma Higton from Birmingham University. The reduction to two teams allowed for some of our up-and-coming players to get an opportunity to challenge some of the (ageing) first team players for places, as well as get valuable experience playing against some very good players in the CEKL. Warriors showed their community spirit completing a recruitment drive through Didsbury (Didsbury Dozen pub crawl) and getting involved in the Wythenshawe Games, a legacy of London 2012, a festival of sport with free trials of korfball for kids. Over summer the club ran a raffle to raise funds for the club and the hard work paid off. A brave few Warriors set off in the pouring rain over the border to Snowdon, with freezing nights and little sleep they conquered the climb. At Nottingham Warriors fancy dress ruled again; Gold & Bronze for our GB Rowers and Boris “Fish” Johnson. Warriors 1 maintained their NWShield for the second year with Kev Jones the competitions top scorer. This was matched with 2nd in CEKL1 only just missing out on Champions Trophy falling 14-13 to Birmingham City on the final day of the season, Kevin Jones taking top scorer in the league too. Warriors 2 had a season of rebuilding with lots of players not having played together before and a good run in saw them top of NWKL2 with Sarah Halstead picking up Female MVP for the NWKL. Warriors hadn’t seen enough court time and organised their own mini league competing with Crewe & Nantwich, Castle and Manchester City. Warriors Dragons team came out on top over the 4 week schedule. Warriors made it to the final of the Lancaster beginner’s tournament missing a penalty in the last shot of the game to steal the match, a great start to the season. Summer saw Warriors attend Manchester, Bristol, Milton Keynes “korfstock” and Nottingham tournaments with a variety of success on the field but the real success coming in the socials! Another successful pre-season recruitment drive saw the arrival of Russel Cox, Elise Cox, Matt Bell, Chris Britton and Liberty Gaunt with new signings of Sarah Halstead from Bristol University and Miriam Wilson from Edinburgh City and the return of Micki Barker from Leeds. 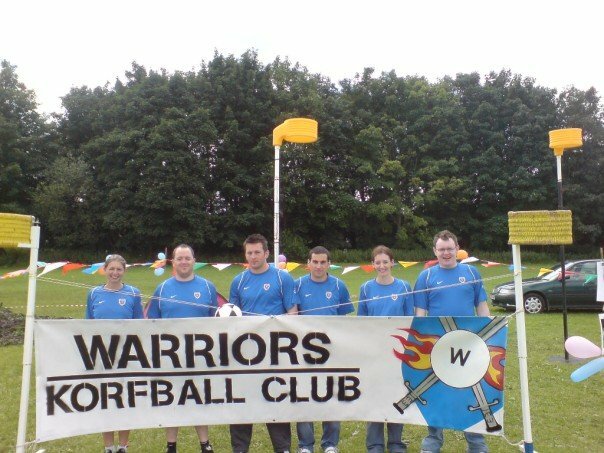 Warriors played a part in the Wythenshawe Games 2013 with more korfball demonstrations and free taster sessions for kids. Off court the club roared in animal fancy dress, partied in Christmas jumpers and dressed to impress. Summer saw the Korfball wedding of the year, Mr & Mrs Blood; who needs a bouquet…. Miki threw a korfball! The new season, 3 teams again and time for Warriors to Roar!!! Warriors 1 stepped up a level in the league in a season which went right to the wire against Nottingham Korfball club, with 26 points a piece and the same goal difference the league was decided on Goals for with Warriors 1 taking the title. Mike Brayne top scored with a massive 92 league goals and over 100 goals in the season. 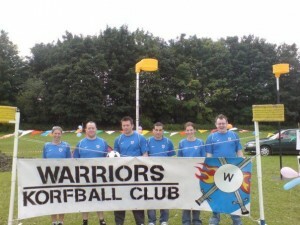 North West Sheild saw Warriors 1 take the title for the third year in a row. The season ended with a 3rd place finish in the end of season Champions Trophy. Warriors 2 put up a strong challenge for the North West title scoring 150 goals but ended up second placed in their North West League 1 campaign. Warriors 3 back in action had a great return season finishing top of North West League 2 after the league split. The club also took part in a mini league post season because we just can’t get enough, another trip to our favourite Edinburgh International Tournament, a win at Castle Korfball tournament and trips to Bristol, Preston and Milton Keynes. New signings of Jo Nash from Cardiff Raptors, Laura Bonney from Oxford University, Jake Tiddy from Norwich Nights, Dani Malerba from Bristol City and Ali Jung from T.C.N.H. in Amsterdam strengthened the squad plus summer new to korfball recruits of Alex Smith, Jordan Roberts, Andrew Packwood, Dan Jackson and Pekka Lehtikangas. The club introduced an extra hour of training to focus on fitness and shooting skills and targeted junior sessions for the first time with the support of Sportivate. Warriors went back to support Wythenshawe games and for fun 12 Warriors took on the Manchester 10k, we also developed a new love for playing rounders and pub golf and Warriors playing cards are our drinking games of choice. Warriors 1 were league champions again, with a close competition being decided on goal difference. Mike Brayne top scored in the league again with 57 goals. Warriors 1 also retained their North West Sheild title before a trip to Champions Trophy following a season of Promo League korfball. Warriors 2 won the North West league in style winning all of their games and securing a 155 goal difference. Warriors 2 also made up the top four scorers in the league; Pete McGuckian, Richard Dawson, Paul Blood and Sarah Halstead. They then faced tough competition in the playoffs and were destined to spend another season in the North West league. Warriors 3 gave experience to lots of newer players and came sixth in the league as teh team started to gel. 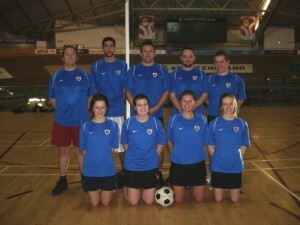 The club was involved in a mini league post season with a number of players making their first appearances for the club. There was of course the annual pilgrimage to Edinburgh International Tournament securing Bronze medals and taking out a number of dutch teams on the way with, another win at Castle Korfball tournament, a win and fourth at the Manchester University tournament, second place at Korfstock and a tour to Attila to secure fourth place. Warriors created a travelling barmy army to support Mike Brayne playing for Scotland and Kevin Jones and ex Warrior Jo Nash playing for Wales in the Europeans in Portugal. Warriors played host to the Student regional BUCS tournament supporting our friends at Manchester University. went back to support Wythenshawe games and for fun 12 Warriors took on the Manchester 10k, we also developed a new love for playing rounders and pub golf and Warriors playing cards are our drinking games of choice. Warriors Chris Cooper and Sophie Laurenson got engaged, an extra celebration for the season! 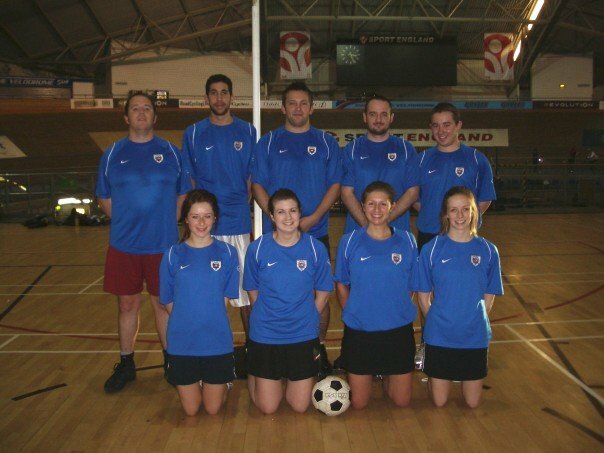 Warriors 1 came second in the league to a strong Birmingham team, securing entry to another season of Promo League Korfball . The team also dominated the league with goals; Emma Higton became the first girl to secure top league scorer with 67 goals, second in all regional leagues for the season; Kevin Jones second and top male league scorer with 60 goals. Warriors 2 dominated the North West league securing the title with 322 goals, conceding only 66 goals and obtained automatic promotion to Central England league 2. Laura Bonney was league top scorer with Tom Shave coming in third. The North West Sheild saw an all Warriors final with Warriors 1 against Warriors 2. Warriors 1 took the spoils for the fifth year in a row. Warriors 3 put in their best ever league performance securing third place in the North West League and provided Warriors 2’s toughest matches. Warriors made our usual attendance at Edinburgh with 2 teams representing on and off court. The club hosted an intra club tournament with some very close games between Andy’s Avengers, Ed’s Emperors and Michelle’s Magicians. And the on court season culminated with the tournament at the 10 year do! The club saw a host of new signings of Zoe Kennedy and Rhianon Mohabir from Supernova, Ben Nickerson and Lucy McConnell from Nottingham and Mattie Hughes and Jade Slater from Sheffield University adding strength to all of the teams. We also had Charlotte Stoddart and Ant Burgess making their Korfball debut. Warriors were loved up again with Andy Clements and Chelle Barker getting engaged and the Cooper / Laurenson wedding due at the end of the season. If there are any errors in this article we apologise!